treatment protocols for this disease. islets in pancreas with chronic pancreatitis [13-15]. preserve islet fun ction (Figure 1) [35,36]. ing chronic pancreatitis progress and during TP-IAT. ing clinical application of islet transplantation [4,27,29]. site that promote survival, and so on (Figure 1). preserve their function after islet autotransplantatio n.
with microcapsules prevents them from apoptosis [52,54]. mechanical properties and ease of processing [59-61]. to new understanding of diabetes of all causes. Talukdar, R., Saikia, N., Singal, D.K. and Tandon, R.
 Dixon, E., Graham, J.S., Sutherland, F. and Mitchell, P.C. tions. 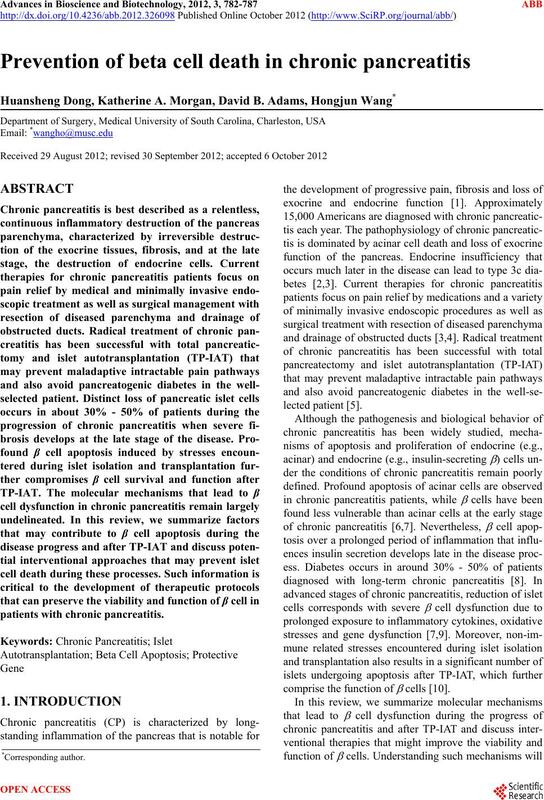 Journal of Clinical Anesthesia, 11, 576-582. Dixon, J., DeLegge, M., Morgan, K.A. and Adams, D.B. ease-based center. The American Surgeon, 74, 735-738.
pancreatic resection. 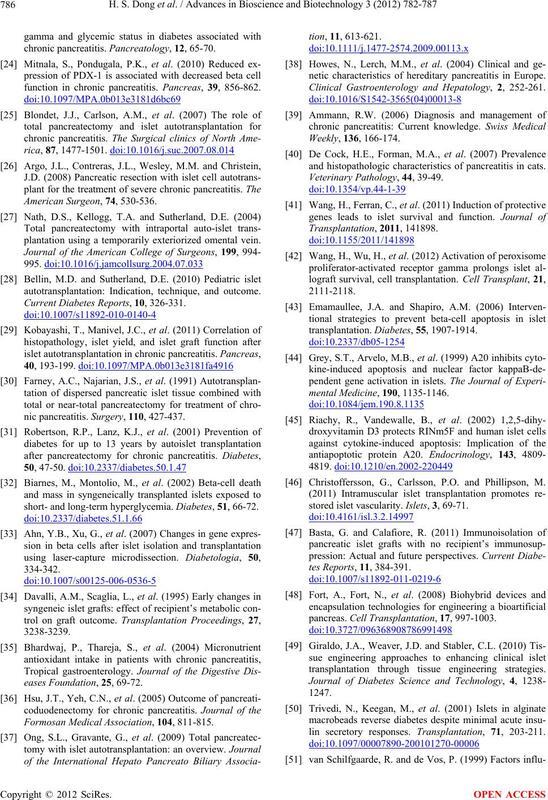 Annals of Surgery, 222, 562-575.
cinogenesis. 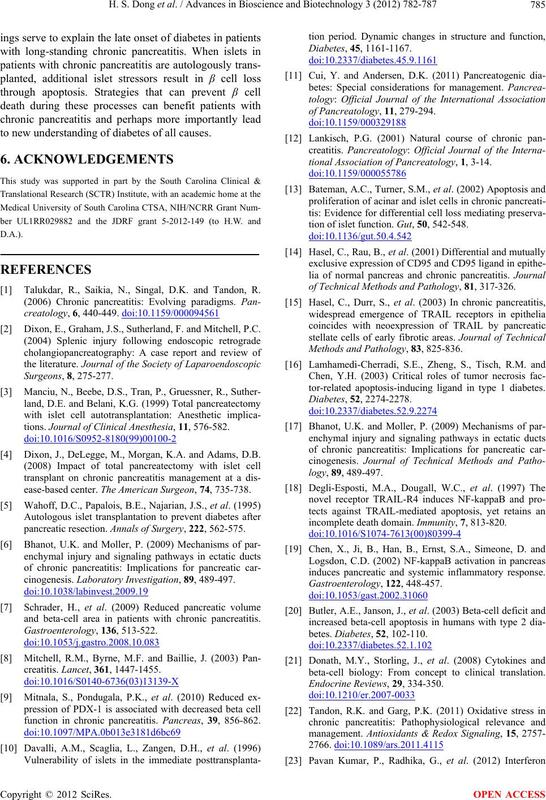 Laboratory Investigation, 89, 489-497.
and beta-cell area in patients with chronic pancreatitis. function in chronic pancreatitis. Pancreas, 39, 856-862.
tional Association of Pancreatology, 1, 3-14.
tion of islet function. Gut, 50, 542-548.
of Technical Methods and Pathology, 81, 317-326. 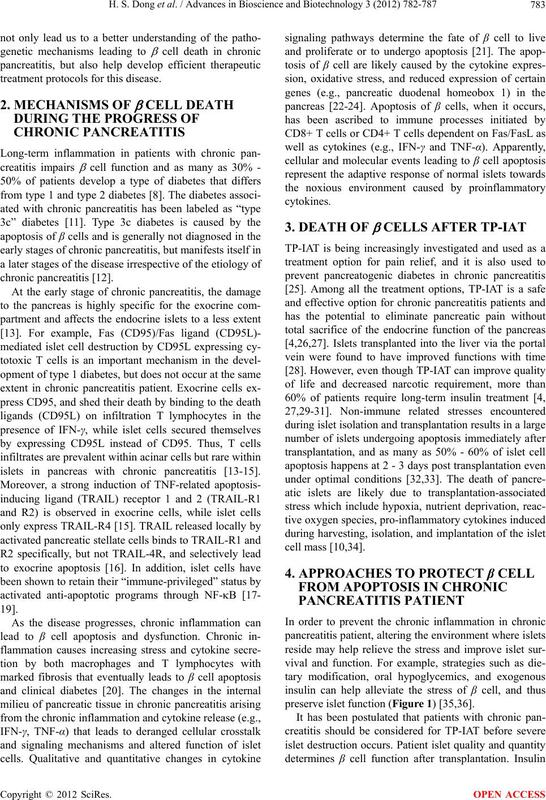 Methods and Pathology, 83, 825-836.
tor-related apoptosis-inducing ligand in type 1 diabetes. incomplete death domain. Immunity, 7, 813-820.
induces pancreatic and systemic inflammatory response. beta-cell biology: From concept to clinical translation. chronic pancreatitis. Pancreatology, 12, 65-70.
plantation using a temporarily exteriorized omental vein. autotransplantation: Indication, technique, and outcome. Current Diabetes Reports, 10, 326-331.
nic pancreatitis. Surgery, 110, 427-437.
short- and long-term hyperglycemia. Diabetes, 51, 66-72. Formosan Medical Association, 104, 811-815.
netic characteristics of hereditary pancreatitis in Europe. Clinical Gastroenterology and Hepatology, 2, 252-261.
and histopathologic characteristics of pancreatitis in cats. Christoffersson, G., Carlsson, P.O. and Phillipson, M.
stored islet vascularity. Islets, 3, 69-71.
pancreas. 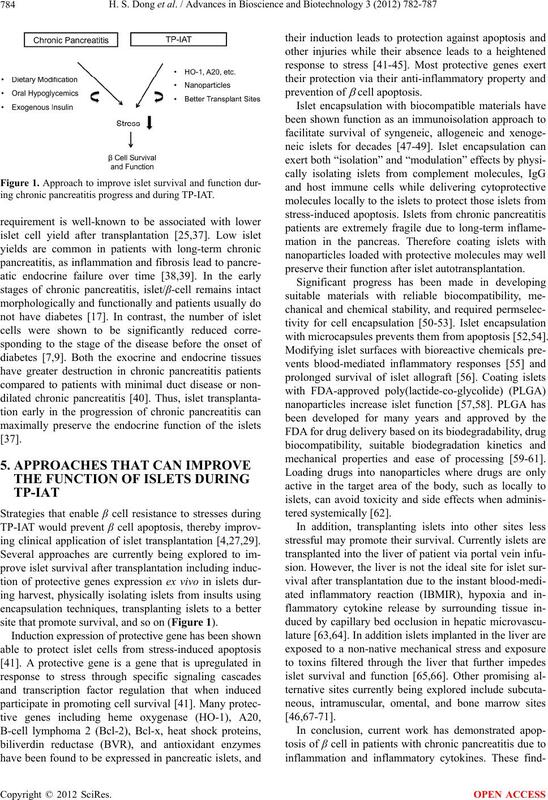 Cell Transplantation, 17, 997-1003.
transplantation through tissue engineering strategies. lin secretory responses. Transplantation, 71, 203-211.
plantation. Pharmacology & Toxicology, 76, 400-405.
cation prevents blood-mediated inflammatory responses. onic stem cells. Biomaterials, 30, 1706-1714. (PLGA) devices. Biomaterials, 21, 2475-2490. Athanasiou, K.A., Niederauer, G.G. and Agrawal, C.M. 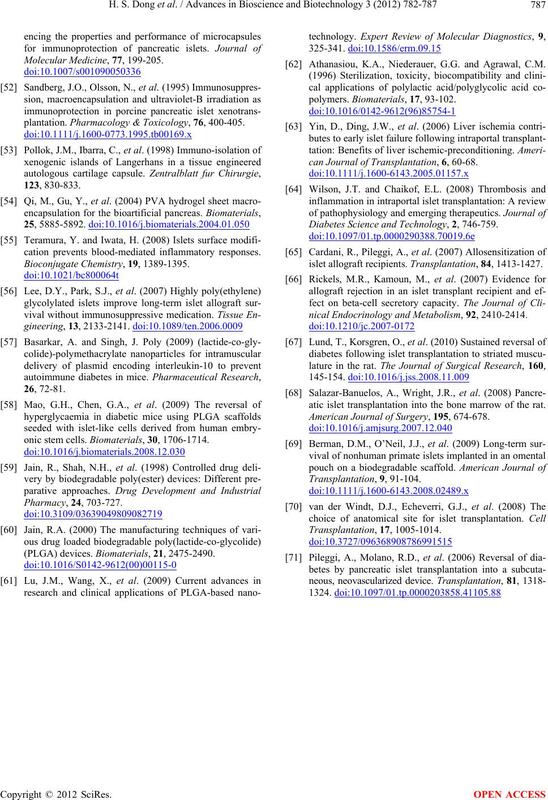 can Journal of Transplantation, 6, 60-68. Diabetes Science and Technology, 2, 746-759.
islet allograft recipients. Transplantation, 84, 1413-1427.
nical Endocrinology and Metabolism, 92, 2410-2414.
atic islet transplantation into the bone marrow of the rat. American Journal of Surgery, 195, 674-678.